It was even more ironic given that the add was for a mobile phone. of course it was for my mobile phone, so that adds to the whole circular nature of the experience, an Nokia taken a photo of a Nokia kind of thing.. all very deep and profound I am sure. I always suspected that these adds were basically simple flash animations just running on a windows box. 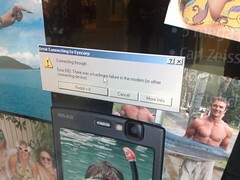 And the windows error message just proves it. Seriously what a waste of computer just to show some simple animations, but I guess some one is a paying a lot for these adverts that cost nothing to build and nothing to run. Yep, I am definitely in the wrong business.